January is the time for New Year’s resolutions, fresh starts and the perfect opportunity to restore your home! We love the end of the year because it means new beginnings, and we’re excited to start off 2019 on the right foot. 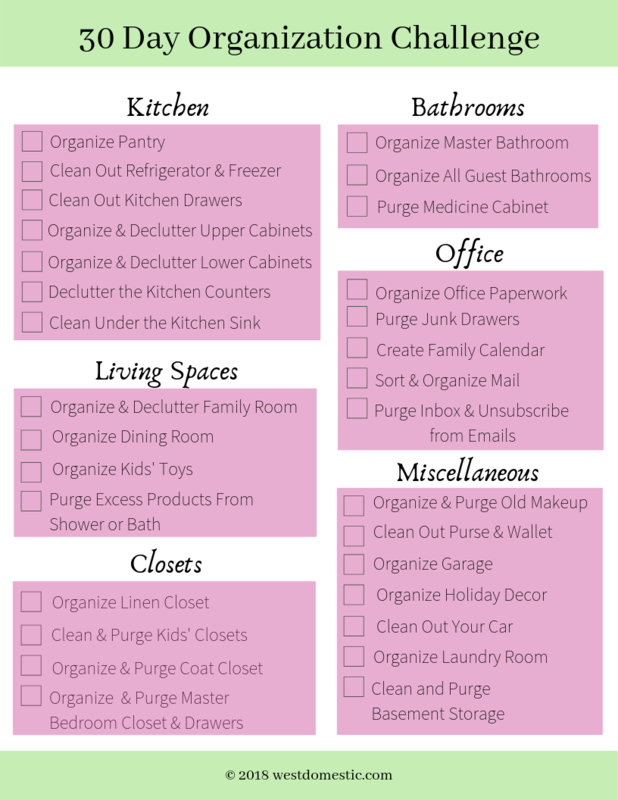 One of the biggest things that my clients struggle with is keeping a home organized. It’s hard to keep a home clean and in order when there’s a million other things to do in a days time. The holidays also have a way of turning your home (and life) upside down so it’s always nice to start fresh come the new year. That’s why we created this challenge! We want to help you start off this new year with the confidence to tackle anything, and research shows that the organization (or lack thereof) of your home, office or personal space has a major effect on productivity. Having a clean and organized home can not only lead you to be more productive but knowing that it’s taken care of is one less item on the never-ending checklist. The items that we have listed for each day will vary in terms of the amount of time that it takes you. Our suggestion is to switch days around if you don’t have the amount of time necessary in one day to complete the designated task we have listed. Another suggestion, if we may be so bold to say it, is to just do it! The sneaky trick about organizational projects is to just start. Sometimes just thinking about the amount of time that it’s going to take will deter us from starting the task at all. Don’t give in! Just start. You will make more progress than you think and it will likely also take less time than you think, too. Keep imaging that amazing feeling you’ll experience once you’ve made some headway and your home will start to feel like it’s yours again!